714年，西藏 (吐蕃王朝) 與中國 (唐朝) , 是邦交國關係. 還有, 若說 西藏是元朝時的中國領土, 其實元朝的領土屬蒙古人, 即現時蒙古國的領土. In 2003, an old Tibetan passport was rediscovered in Nepal by Tibet independence supporters. 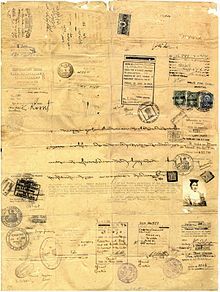 Issued by the 13th Dalai Lama to Tibet's finance minister (Tsepon Shakabpa) for foreign travel, the passport was a single piece of pink paper, complete with photograph, and had visas issued by many countries, including Britain. Fifty-six years ago on the roof of the world – Lhasa – the first Tibetan passport was prepared that was recognized by various nations. Twelve years ago, the passport that represented a sound affirmation in world opinion of Tibet's de-facto independence and was of immense historical significance, went missing from Kalimpong. 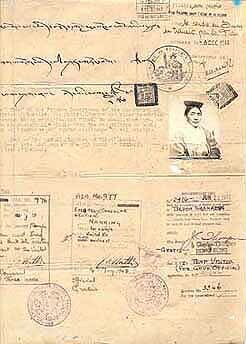 The passport is a big spreadsheet of the traditional Tibetan hand-made paper folded and old-looking. It bears stamps of many countries, which granted visas and transit permits to Shakabpa. The passport was issued by the Kashag (Cabinet of Tibet), Lhasa, on 26th day of the 8th month of Fire Pig Year (Tibetan). The date coincides with October 10, 1947. The passport bears official stamps of recognition by countries like India, United Kingdom, United States, Italy, Switzerland and France. Processed in 0.035113 second(s), 9 queries, Gzip enabled.